"Post-Truth" might be Russia's greatest export to the world yet. 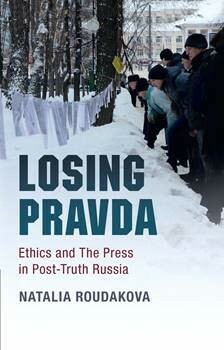 Combining ethnography, media analysis, moral and political theory, Roudakova examines how journalism and its truth-seeking ethic was made superfluous in Russia over the past twenty five years; and the powerful effect that has produced on society. Contrary to widespread assumptions, Roudakova argues that late Soviet-era journalists shared a cultural contract with their audiences, which ensured that their work was guided by a truth-seeking ethic. Post-communist economic and political upheaval led not so much to greater press freedom as to the de-professionalisation of journalism, as journalists found themselves having to monetise their truth-seeking skills. This has culminated in a perception of journalists as political prostitutes, or members of the 'second oldest profession', as they are commonly termed in Russia. "Fake news," kompromat, swirling rumors and cynicism, punctuated here and there by the courageous few committed to telling the truth but distrusted or dismissed even by peers, became the feature of the day in Russia. Roudakova argues that this cultural shift has fundamentally eroded the very value of truth-seeking and telling in Russian society. Beyond Russia, this work illustrates what could happen to a country's public life when collective truths are regularly displaced by systematic falsehoods and fabrications. The event will be followed by a drinks reception at 6.15pm in The Pavilion, University Building, Northampton Square entrance.